Islam in the Former Russian Empire: Encyclopaedic Lexicon. Fasc. 5 [Ислам на территории бывшей Российской империи: Энциклопедический словарь. Вып. 5] / Ed. by S.M.Prozorov; Advisers O.F.Akimushkin, V.O.Bobrovnikov; Indices by S.M.Prozorov, T.N.Satpaeva. Moscow: Vostochnaya literatura 2012. 232 p. + fig. Let me hasten to offer my apologies to the authors of Issue 5 of the Encyclopedic Lexicon and to its readers for the long delay in its production. This delay was caused by my numerous commitments related to the Institute’s administration, on the one hand, and the circumstances beyond my control, on the other. Despite the recent spate of publications on Islamic topics, including reference works, the demand for knowledge of Islam and Muslims among the educated Russian-speaking public remains strong. This demand is attested, among other things, by letters that we receive from the users of our site. Methodologically and structurally Issue 5 is analogous to its predecessors. The entries contained therein discuss ways in which Islam has existed and functioned on the territory of the former Russian Empire until today. This last Issue includes 78 entries by 26 authors from Russia (Moscow, St. Petersburg, the Krasnodar Region, Ufa, Kazan, Makhachkala, Astrakhan), Uzbekistan (Tashkent, Bukhara, Khokand), Azerbaijan (Baku), the Netherlands (Amsterdam), the USA (Maryland), Latvia (Riga), France (Paris). 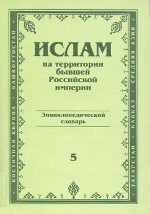 As with the previous issues of the Encyclopedic Lexicon this one addresses various forms of Islam’s existence in different areas of Russia (the Central-European region, the Northern Caucasus, Bashkortostan, Tatarstan, the Astrakhan region), Cen¬tral Asia (Uzbekistan, Turkmenistan), and Azerbaijan. The entries deal with a wide variety of topics — personalia, cultic sites, architectural monuments, terminol¬ogy, written monuments, rituals, etc. The Issue features a large number of illustrations (tables, graphs, black-and-white and colored photographs) and eight indices that enable the reader to extract the maximum possible information from the en¬tries contained therein. Hopefully, these features will help to expand the readership of the Encyclopedic Lexicon by attracting to it all those interested in benefitting from academic approaches to Islam, its value system and social practices of its followers. Russia, 191186, St. Petersburg, 18 Dvortsovaya nab. On March 22, 2017, at the meeting of the Council of Young Scholars at the IOM RAS, PhD. N.V. Yampolskaya will read a lecture The Margins in the Mongolian Manuscripts of the Pothi Format.